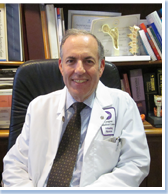 Dr. Lawrence Rosman, M.D., F.A.C.P., F.A.C.E. Dr. Lawrence Rosman is a licensed M.D. and a Diplomat of both the American Board of Internal Medicine and the American Board of Endocrinology and Metabolism. He graduated with honors from the New York University School of Medicine and received his training at the New York University Medical Center. Currently, he is a consultant endocrinologist at the New York Hospital of Queens, and is the past Chief of Endocrinology at the Parkway Hospital. In addition to his practice, Dr. Rosman is an Assistant Professor of Medicine at the NYU School of Medicine, and a member of the American College of Physicians, American Diabetes Association, the International Society of Clinical Densitometry, and the Endocrine Society. Dr. Rosman is a past recipient of the Certificate of Recognition from the American Diabetes Association, noting his achievement for delivery of quality diabetes care. Dr. Elana Rosman is a licensed M.D. and board certified in both Internal Medicine and Endocrinology and Metabolism. She received her medical degree from NYU School of Medicine and completed her medical residency at Mount Sinai Hospital in New York City. She then returned to NYU to complete a fellowship in endocrinology, diabetes and metabolism. In addition to her practice, Dr. Rosman is a practicing endocrinologist on the teaching staff of NYU School of Medicine. She maintains a special interest in women’s health as well as issues of infertility.